Our troubles, temptations, strongholds, and enemies are not too big for our God. Often times I have been at the point where I wonder if I am going to be overcome by my troubles. I fear people saying, “Where is your God now.” Then the Holy Spirit reminds me I serve Elohim, God the Sovereign, Powerful, Creator of Heaven and Earth. He is Jehovah-Jired always there willing to supply all of our needs. He is El Shaddai, God Almighty. Then in the movie screen of my mind I begin to see stories of deliverance from the bible playing. I am reminded of other times where God has personally rescued and provided for me and my family. I am suddenly filled with excitement and faith knowing our God is powerful and faithful. One of my all time favorite stories of God’s deliverance is the story of Daniel in the lions den.You may know the story. Daniel was one of three presidents of Babylon helping king Darius rule over the Medo-Persian Empire. He was a godly man who proved more capable than the other presidents and governors. The king was contemplating putting Daniel to rule over the entire empire as his administrative officer. This made all of the other presidents and governors very jealous. They began plotting on Daniel, trying to find fault in the way he handled his affairs. But they couldn’t, they knew their only chance was his religion. They devised a plan to have a law made and approved by the king which said no one would worship or pray to any other god. King Darius approved their decree forbidding petitions to any god or man except to him for a thirty-day period. This law was irrevocable under the law of the Medes and Persians. Anyone who disobeyed would be thrown into the lions’ den. Daniel’s haters knew he loved God and he prayed three times daily. Once the law was approved they immediately went to see if Daniel would continue seeking God’s face anyways. They saw him praying in his window and they went running to tell the king. The king was upset with himself and wanted to save Daniel, but he couldn’t undo what had been done. By decree he was forced to order Daniel to be thrown to the lions. The king said to Daniel before throwing him in, “May your God, whom you worship continually, deliver you.” The king was so upset he couldn’t eat, refused entertainment, and couldn’t sleep all night. The birth of a baby, this is one of his most precious miracles. The raging ocean knowing it can only go so far, normally not passing the boundary God set on the shore. A delay in your day causing you to run late to work, keeping you from getting in a terrible car accident which happened around the same time and place where you would have originally been on that road. A message, text, email, or call from someone giving you a word of encouragement out of no where, who knows nothing about what’s going in your life. A unexpected check in the mail which helps meet your financial need. Someone dropping you off groceries just when you were running out and were short on money. The most harden hearted, rebellious sinner you know, who has spent a life time-serving the devil, repenting and truly surrendering their lives to God. These are all precious miracles that we should not take for granted. Always remember nothing is too hard for our God, so keep believing in Him. He is still in the business of doing miracles. Lord help us to be sure of the fact you are still in the business of doing miracles. Give us eyes to see some of the miracles around us daily we too often take for granted. 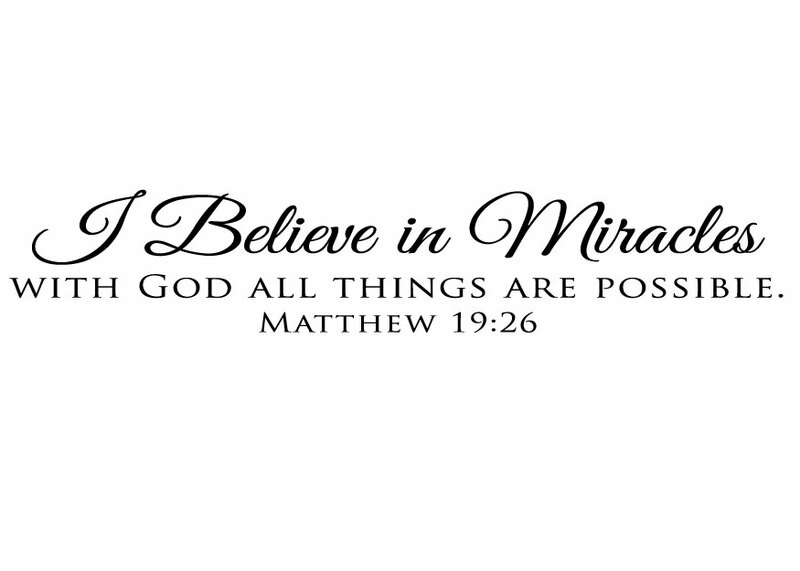 Help us to not be afraid to pray for those mighty miracles we know only you are capable of doing. Let us have faith like Daniel and like other heroes recorded in scripture? We love you and trust you regardless of whether you choose to do a mighty miracle or not. Jesus is enough for us. “In Jesus’ name.” Amen.